Five Stephen F. Austin State University students in the hospitality administration program recently traveled with Dr. Gina Fe Causin, assistant professor, to Las Vegas to participate IMEX America, a worldwide exhibition for incentive travel, meetings and events. Pictured from left are Jade Godoy, Kristan Cates, Kaitlyn Borland, Joseph Dorgali, Causin and Mackenzie Tarter. NACOGDOCHES, Texas - Stephen F. Austin State University students in the hospitality administration program recently traveled to Las Vegas to participate in IMEX America, a worldwide exhibition for incentive travel, meetings and events. One of the nation's largest trade shows, IMEX America showcases various companies, including domestic suppliers, tourist offices, hotels, airlines, cruise lines, spa resorts and technology providers. Additionally, more than 180 educational and networking events take place during the show. This year more than 3,000 exhibitors representing 150 countries participated. 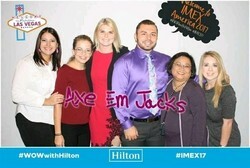 Dr. Gina Fe Causin, assistant professor in SFA's hospitality administration program, attended IMEX America with five SFA students: Kaitlyn Borland, Kristan Cates, Joseph Dorgali, Jade Godoy and Mackenzie Tarter. "These kinds of trips give students insight into their careers and help show them where they may want to work," Causin said. "Networking is huge. Students heard from speakers who are CEOs and business owners. For example, our students met with a professional concert planner." During the trade show, students participated in the prestigious Future Leaders Forum, which brings industry leaders together to network, provide international and regional insights, and discuss key field-related topics. "The forum is a great opportunity for our students, and I'm proud they were able to participate in this select discussion," Causin said. During the show, Causin also presented research and participated in a faculty-engagement session. While in Las Vegas, students toured the Venetian and Palazzo resorts where they learned about the resorts' sustainability features and artwork. Students also enjoyed an exclusive "back-of-the-house" tour at the Palazzo. "The trip opened the students' eyes to the industry. For example, they were able to see how a concierge has to take care of guests and always follow a high standard," Causin said. "Students learned the importance of selling the experience to guests."